This driver has been acoustically engineered for a hot, solid sound and feel and will be the star of the course! 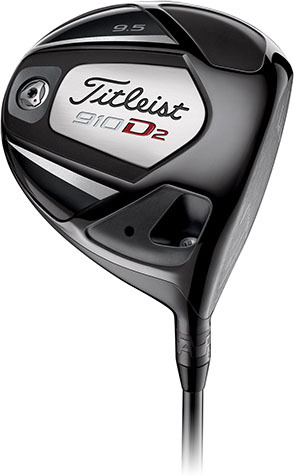 The Titleist 910 D2 Driver delivers longer distance through a technologically advanced head design with a responsive, fast face insert that creates a ball-speed area that is 15% larger than other drivers. The patented, innovative, SureFit Tour dual-angle hosel provides precise and independent loft and lie adjustments to fine tune ball flight for more accuracy and control. High performance weighting and a sloped, ultra-thin crown design increases stability and creates a low and deep center of gravity for medium/high launch with medium/low spin. This driver has a higher launch and spin that the Titleist D3. An interchangeable shaft connection and rear weight screw provide enhanced fitting options and the full pear-shaped profile has a a rich black, PVD and paint finish that instills confidence at the address. This driver has been acoustically engineered for a hot, solid sound and feel and will be the star of the course!